The report ... also shows that 6.29% of the electricity used in Wales comes from renewable sources – lower than the UK average of 7.45% and way behind Scotland's 22.45%. Both Wales and Scotland export electricity; but GA have done the maths in such a way that a proportion of electricity generated in Wales and Scotland from renewables is accounted as being used in England and Northern Ireland. They start with net electricity generated, and rightly make a percentage allowance for transmission and distribution losses (on average 7.5%). So far so good. But they then indulge in some mathematical sleight of hand by compounding this with the electricity Wales and Scotland export. The effect is to reduce the percentage figure from renewables for exporters of electricity like Wales and Scotland, but increase it for importers of electricity like England and Northern Ireland. 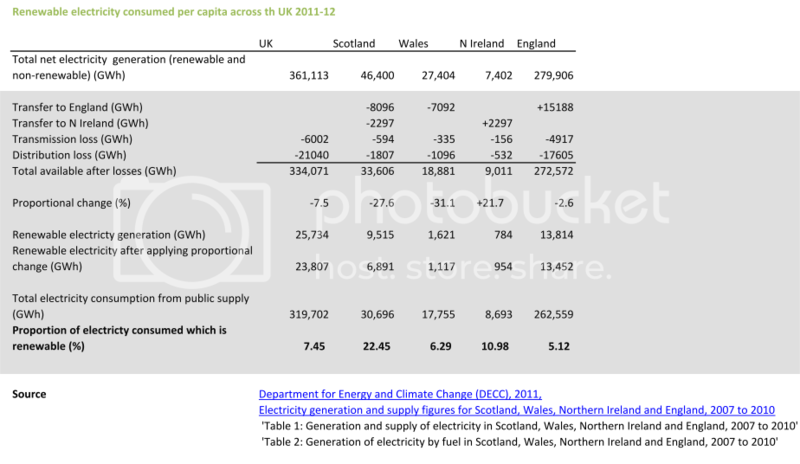 Therefore Wales' electricity generation from renewables gets reduced by 31.1% instead of 7.5% (it's slightly less, but the UK average figure will do), Scotland's gets reduced by 27.6% instead of 7.5%, England's gets reduced by only 2.6% instead of 7.5% and NI's actually increases by 21.7% instead of reducing by 7.5%. This is not exactly wrong, for electricity is electricity no matter how it has been generated. But it masks the overall picture, which is that England and NI are consuming electricity that has been disproportionately generated from renewable sources in Wales and Scotland, making their renewable figures look better at our expense. It would be clearer to say that Wales' 1,621 GWh/yr should be reduced by only 7.5% for transmission and distribution losses to 1,499 GWh/yr, i.e. that the electricity we generate from renewables accounts for 8.45% of the electricity we consume rather than 6.29%. The equivalent figure for Scotland would be 28.67% instead of 22.45%. 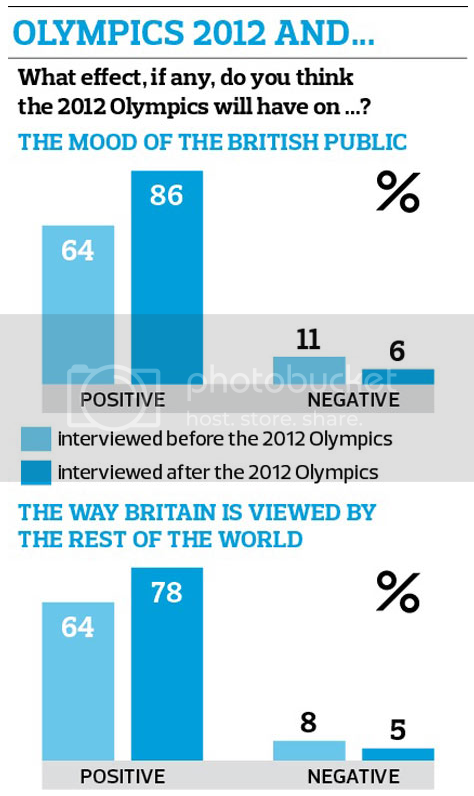 But for NI the figure would be 8.34% instead of 10.98%, and for England it would be 4.87% instead of 5.12%. One firm in Swansea said it routinely asked foreign interns to look over writing done by young recruits in Wales as the grammar of the second-language English speakers was usually superior. I've no doubt that it's true. Those who can speak two languages usually have a better understanding of both since, by being able to compare one with the other, the differences in grammar are highlighted and therefore easier to comprehend. Those who speak only one language are at a disadvantage by having nothing to compare it with. My only question is why they should look abroad. Wales has plenty of second-language English speakers who could do the same job equally well. 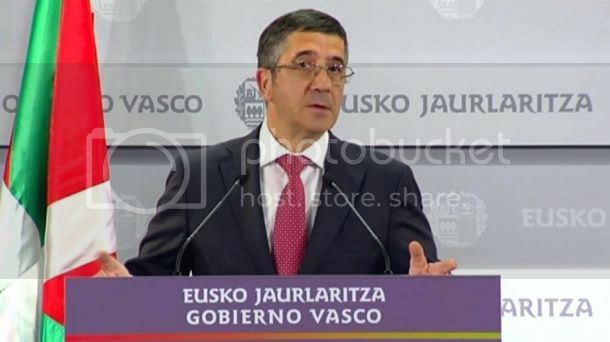 The current leader of the Basque Government has just announced that elections will be held on 21 October this year, five months earlier than would normally be expected. The government that had been formed following the 2009 election was an "unholy alliance" between the two main Spanish parties, the socialist PSOE (or PSE-EE in its local form) and right wing PP, formed with the sole purpose of preventing a nationalist government for the first time in nearly thirty years. Normally the centre-right nationalist EAJ-PNV was able to form a government with occasional support from the smaller left-wing nationalist parties, but last minute bans on two of these parties meant that they won maybe half a dozen fewer seats than they would normally. This blatant gerrymandering proved to be just enough to allow the formation of a PSOE-PP governing coalition ... with a majority of just one in the 75 seat parliament. Needless to say, it wasn't a particularly happy marriage. It was the equivalent of expecting Labour and the Tories to work together here. Apart from wanting to keep the nationalists out of power, there was practically nothing else they could agree on. The PP withdrew their support from the PSOE after winning power in the Spanish general election in November last year. As we would expect from a right wing party, they embarked on a savage austerity programme involving cuts that no left wing party could be expected to agree with, even though they would probably have done exactly the same thing if they had been in power. The EU wouldn't have given them much choice. Put bluntly, Spain's economy is in such a mess that there is very little room for manoeuvre for either left or right, but a party in opposition always has the luxury of saying they would do something different. Perversely, this wasn't helped by the Basque economy being in markedly better shape than anywhere in Spain. While Spanish unemployment is at 24.4%, in Euskadi the figure is 13.5%. Not good, of course, but a lot less bad. Over the years, and with the benefit of almost full fiscal autonomy, the country has become more economically prosperous than any part of Spain. It has a higher credit rating and lower borrowing costs than Spain. Not that it needs to borrow much anyway, for its deficit-to-GDP ratio is only 0.25% compared with Spain's ratio of 90%. The figures are here and here. It all means that Euskadi does not have to take the same extreme steps to put its economy in order as Spain does. The problem was that Paxti López was rather more focused on his image in Spain than what was happening in Euskadi. He was being widely tipped as a future PSOE leader in Madrid, and his political line was to point to the Basque economy and use it as a supposed example of how much better things would be if Spain adopted the PSOE's cuts than the PP's cuts. Disingenuous because Euskadi's economic success had been built on the foundation of nationalist policies over several decades rather than PSOE policies in the last couple of years. For their part, the PP couldn't continue to work with him while he was playing that game. They withdrew support and he was a dead man walking from then on. He kept denying that he would call early elections, but this announcement has not really come as any big surprise. So what can we expect of these elections? The first thing to say is that the political landscape has completely changed. The pro-independence left was determined to make sure that what happened in 2009 would never be repeated. It acted on two fronts: the parties worked together to form a united platform for elections, and they took pains to disassociate themselves from any connexion with ETA. In parallel ETA first declared a new ceasefire and later made that ceasefire permanent. Who persuaded whom to do what depends very much on your perspective. For Spain, ETA were in always in the driving seat, and seeking Basque independence by political means was never more than a front for terrorism. Such thinking resulted in the first platform, Sortu, being almost immediately banned on the grounds that anyone who wanted independence must by definition be associated with ETA. A second platform called Bildu was then formed and banned as well. But when the EAJ-PNV withdrew its support from the minority Spanish government in protest, the Constitutional Tribunal promptly overruled the Supreme Court decision. This showed the world that the Supreme Court's decisions had been taken for political rather than judicial or constitutional reasons, and the Spanish game was effectively over. Bildu stood in the municipal elections of May 2011 and the result was remarkable: it won more seats than any other party. Analysing that result here and here, the major swing was away from the Spanish left (the PSOE) towards the Basque left (Bildu). Broadly speaking there were now four major parties/groups: a Spanish left and right (the PSOE and PP) and a Basque nationalist left and right (Bildu and the EAJ-PNV), but the Spanish parties were now being marginalized. On the right of the political spectrum the PP had always got far less support than the EAJ-PNV, but now the same was true on the left of the political spectrum as well. As I saw it, Basque voters with views on the left of the political spectrum had previously been inclined to vote for the Spanish PSOE first because the nationalist left was associated with violence and second because of the confusing number of often squabbling small parties (not of course helped by them frequently getting banned and then reforming as something else). But now that the pro-independence left had finally got its act together, voters started switching en masse from the Spanish left to the Basque left. In the Spanish general election in November 2011 Bildu expanded to become Amaiur, and once again won more Basque seats than any other party. Details here. The one thing that we can say with almost complete certainty is that Paxti López and the PSOE will be the big losers in the upcoming elections in October. The main contest will be between the Basque nationalist left in the shape of EH Bildu (they haven't quite lost the habit of continually changing their name) and the Basque nationalist centre-right in the shape of the long established EAJ-PNV. The PSOE and PP will be a long way behind. The opinion polls conducted so far this year (at the bottom of this page) show the EAJ-PNV in a range between 29% and 35%, EH Bildu between 25% and 28%, the PSOE between 15% and 20% and the PP between 12% and 17%. However this won't translate directly into numbers of seats, for although the voting system is proportional in each of the three provinces that form the Basque Autonomous Community, each of them has a flat 25 seats even though they are quite different in terms of population size. Personally, I would expect the PSOE to be squeezed even more than the polls suggest. Voters do tend to put the knife into a dying party, so I would expect a much closer race between EH Bildu and the EAJ-PNV. Whichever party gets most seats, neither EH Bildu nor the EAJ-PNV will be able to govern alone. So the question is whether the next government will be formed on left-right lines or on nationalist lines. There are only three possibilities: the EAJ-PNV could form right-of-centre government with support from the PP; EH Bildu could form a left-of-centre government with support from the PSOE; or there could be a nationalist coalition. I'll write about the likelihood, and consequences, of each of these outcomes in another post. One of the big policy debates within the SNP is whether they should change their position about not seeking to be a member of NATO if they were in government in an independent Scotland. I thought it would be useful to compare Scotland's situation with that of Wales. In principle, I have never had any objection to an independent Wales being a member of NATO. For me, the argument that by being part of this alliance we are therefore relying on nuclear weapons for our defence has never held water. My reasoning is that it is impossible to use such weapons for defensive purposes, and therefore they are irrelevant to our defence irrespective of what other countries might believe. No country is required, or expected, to see eye-to-eye with its allies on every issue. It is sufficient for the alliance to have a common purpose—namely that of mutual defence—but not necessary to agree on the type of weapons needed to implement that defence. ... The issue I want to focus on is why NATO as an organization should become involved. I don't think anyone could read the North Atlantic Treaty of 1949 as anything other than setting up an alliance for mutual defence in response to an attack on any of its members. Yet NATO seems to be inexorably changing into a force that is openly being used for offensive purposes. Perhaps, but only perhaps, one could claim that the security of some of NATO's member countries was threatened by Afghanistan. I would call it an indirect and at best a very tenuous link. Yet NATO is there, halfway across the world from the legitimate sphere of concern set out in its founding treaty. However in the case of Libya, there is absolutely no threat to the security of any other country, let alone one that is a member of NATO. It is a purely internal matter. So it is perhaps legitimate for countries such as the USA, France and the UK ... plus others such as Belgium, Canada and Qatar to conduct attacks in Libya in their own right, as an "alliance of the willing". But it cannot be legitimate for a defensive organization to conduct such attacks, even if all 28 members were to agree that they want to be involved in the operation. NATO has served us well over the past 60 years, and all organizations need to adapt over time; but to my mind these fundamental changes are now taking NATO way beyond its intended purpose and can only weaken it. In Afghanistan we have already seen the reluctance of some members to contribute their own forces to operations they aren't keen on. Albania, Bulgaria, Croatia, Iceland and Luxembourg have not contributed to the NATO led forces in Afghanistan, other members only contributed limited logistic support and others seem only to have made a nominal contribution on condition that their armed forces were as far out of harm's way as possible. In this new operation in Libya even fewer will take part. This is quite understandable, but by setting the precedent of only taking part if you want to, NATO runs the risk of countries taking the same attitude if any member were actually to be attacked ... and that's what it's really there for. In short, if NATO remains a defensive organization I have no objection to an independent Wales being a member. But if NATO continues to get involved in operations that have nothing to do with defence, we should not seek to be part of it. At the very least we should be given cast iron guarantees that we could opt out of any operation which we consider not to be for defensive purposes. If I'm any judge of the general opinion within the SNP, I think they would take exactly the same view ... if it were not for the fact that the UK's nuclear weapons are currently based in Scotland. So we need to look at that issue. Successive parliaments in Belgium have, since 2005, called on their government to put forward proposals for the withdrawal of US nuclear weapons. In April 2010 the Dutch parliament adopted a resolution urging their Foreign Minister to tell the US Government that the weapons in Holland should be withdrawn. Most political parties in Germany, including the Free Democratic Party (FDP), are opposed to the presence of these weapons. Since 2009, the FDP have been part of the coalition government and have filled the post of Foreign Minister. The FDP insisted that the coalition agreement includes a clause calling for the removal of US nuclear weapons from Germany. The question of what to do with these bombs had been a topic of discussion within NATO for many years. In 2010, a concerted move was made by Germany, Belgium and the Netherlands to urge NATO to rethink its nuclear policy. However, this initiative has run into the sand. The alliance set up a Deterrence and Defence Review. The final drafting of the report from this review was dominated by a Quad of four countries, three of which were the states with their own nuclear weapons (Britain, France and the US). The report, agreed at the Chicago summit in May 2012, not only failed to recommend any significant change in nuclear policy, but it endorsed America’s plan to spend $11 billion modernising the B61 bombs. This B61-12 programme will turn these freefall nuclear bombs into precision guided weapons. Germany, Belgium and the Netherlands could insist that the US must remove nuclear weapons from their soil. However, in each case, the democratic will of the population has not been carried out, because it was in conflict with the desire to maintain cohesion and consensus within NATO. If these three countries have had so much difficulty in getting a fellow member of NATO to remove its nuclear weapons from their soil, the precedent has been set for the RUK to be equally intransigent over the removal of its nuclear weapons from Scotland. Bear in mind that the B-61 bombs are small and therefore there is no real technical difficulty in moving them elsewhere. That isn't the case with Trident. I think a very good case could be made for saying that if Scotland is serious about getting rid of the nuclear weapons based there, they will find it harder to do if they become a member of NATO for purely political reasons. There is a second factor which complicates matters even further. It hardly needs saying that CND as an organization is committed to getting rid of all nuclear weapons. It is clear that they regard getting rid of nuclear weapons from Scotland as a way of forcing the RUK to get rid of its nuclear weapons completely, because there is no obvious place to build alternative facilities. I'm not at all comfortable with this. It is one thing for the government of an independent Scotland to decide to get rid of nuclear weapons, but it isn't right to exploit that situation to force what is left of the UK to get rid of its nuclear weapons too. Like it or not, the UK has democratically elected governments which have consistently chosen to retain nuclear weapons. The government of an independent Scotland could no more say to the government of the RUK that it's their problem and they have to deal with it than the Dutch government could say it to the Americans. What can the Dutch do? Put the B-61s onto a barge, tow it to the middle of the Atlantic and tell the Americans to come and get them? Governments need to act in a rather more responsible way where nuclear weapons are concerned. And that's the nub of the problem. Like it or not, there is currently nowhere else for Trident to be based. The weapons will have to stay in Scotland until the RUK builds new bases for the missiles and submarines or decides to decommission them. Either course of action will take time. Therefore the only practical option is for the RUK to retain a ten or fifteen year lease on the Faslane and Coulport bases, and the test of their good faith in removing the submarines and missiles when the lease expires will be whether they start to build alternative bases for them within the next few years. However that has nothing to do with whether an independent Scotland is a part of NATO, which removes the argument that not being part of NATO is the only way to ensure that the weapons are removed from Scotland. Which brings me back to the point from which I started. Nuclear weapons have nothing to do with membership of NATO. The real issue is the nature of NATO itself, and specifically what direction it might take in future. If the SNP believes that NATO's aggressive operations in places like Afghanistan and Libya are not going to become the norm then NATO is an organization that is worth joining. If it's good enough for Norway, Denmark and Iceland, friendly countries that Scotland's armed forces will need to work with to defend themselves and Europe against any threat from the north, then it makes good sense for Scotland to be part of that defence structure. Besides that, NATO could do with another voice arguing to prevent it becoming involved in non-defensive operations such as Afghanistan and Libya. So to my mind, the only reason to retain the policy of not joining NATO is if the SNP is convinced that NATO has moved irreversibly beyond its stated treaty aims to become an organization by which the USA and other countries (including, sadly, the UK) can seek to impose their will on other parts of the world through the use of force. Really? I thought the point of a Secretary of State for Wales was to be a great representative for Wales at the cabinet table. With a hat tip to Reagrupament International, I've just read a remarkably well-informed article in the Financial Times on the economic situation in Spain, how it is being used by the Spanish government as a pretext for revisiting the automony of its autonomous communities, and the ramifications for Catalan and Basque independence. 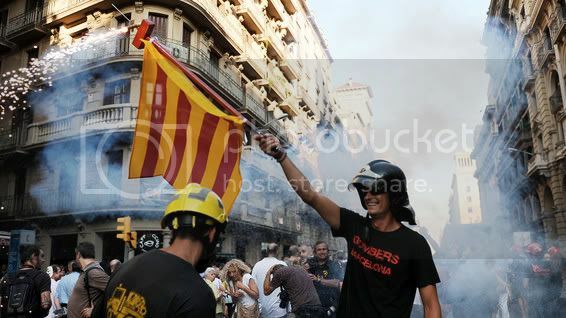 Inflammatory talk: firemen in Barcelona protest against austerity measures. To read it, people will need to register; but we can read eight articles a month for free. "The only time they might provide anything near that power is when the wind is at gale force. Let's do some basic maths. The installed capacity of Gwynt y Môr is 576 MW. This means it has the potential to generate 576 x 24 x 365 MWh of electricity in a year. The operators believe it will produce 1,950 GWh a year, which it would achieve at a capacity factor of 38.6%. That's certainly well within the realms of possibility for an offshore wind farm, although to be safe it might be better to use a more conservative capacity factor of 35% (this is the normal average achieved by North Hoyle, for example) which would result in a production figure of 1,766 GWh a year. I've never had time for expressing electricity generation in terms of how many homes it will supply. It's confusing and I think it's always better to deal in precise units. But for what it's worth the figure that has most generally been used is 4,700 kWh/yr and on that basis Gwynt y Môr will provide electricity for 375,000 to 415,000 homes without taking transmission losses and the like into account. However the latest DECC estimate puts average household consumption at 3,300 kWh/yr, varying from a low of 2,100 kWh/yr to a high of 5,100 kWh/yr. This wide variation means people can make all sorts of claims and counter-claims. But it's certainly not unreasonable to say that Gwynt y Môr will provide electricity for a third of the homes in Wales ... so long as we bear in mind that domestic consumption only accounts for about 35% of final consumption and 30% of the total supply of electricity, as shown here. I think it's more helpful to look at things in this way. In round terms, we need to generate just under 20 TWh of electricity a year to meet Wales' needs. Gwynt y Môr will generate between 9% and 10% of it. I'm meant to be taking a break from blogging but, thanks to Plaid Wrecsam, I've just seen that my friend Ian Johnson has won a by-election seat in the Vale of Glamorgan from Labour with a swing of 12.3%. 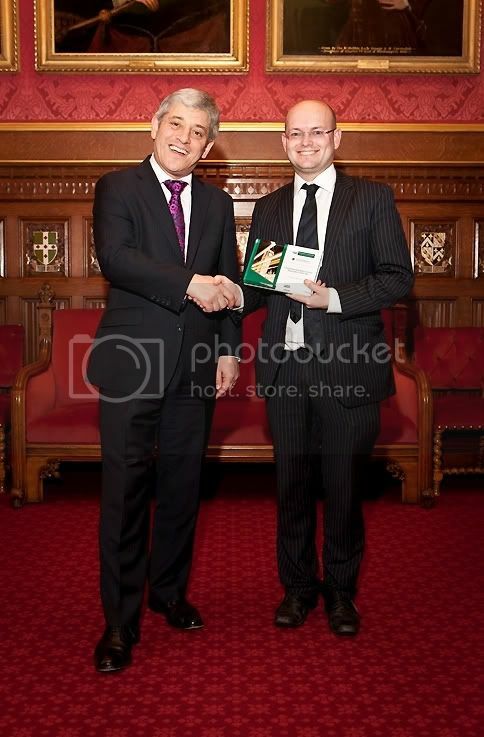 So let me add my congratulations to those of the Speaker of the House of Commons.